The 69th death anniversary of Justice M T Akbar (KC) was observed on last Sunday. In fact, Justice Akbar was one of the most distinguished sons of the Malay Community. He was a descendent of a powerful and influential Malay family whose members held commission in the famous Ceylon Rifle Regiment. Justice Akbar received his early education at Royal College where his career was not only brilliant, but exceptional. In the college he won the Turnour Prize, the de Soysa Science prize, the English essay prize and also won the government university scholarship. Thereafter, he proceeded to Cambridge and his record at Cambridge was splendid. He returned to Ceylon as a Barrister-at-law (Gray's Inn) with a BA, LLB (Can tab) behind his name. He was even a qualified engineer. After practising as an Advocate, he joined the Attorney Generals Department as a Crown Counsel on June 9, 1909. During 1918 to 1919, he was an Acting Additional District Judge, Colombo on several occasions. From 1920-1921, he was an acting Solicitor General and was appointed as Solicitor General on October 6, 1924 and became Attorney General on November 1928 and thereafter he was appointed as Supreme Court Judge. He was the first Muslim to adorn the Supreme Court Bench and was also the first Muslim to he raised to the status of ‘King's Counsel’ (KC). Justice Akbar was the respect of all sections of the people and his first love was his religion. Even as a Judge, he used to retire to his Chambers for his mid-day prayers. He strictly adhered to the teachings of Islam and at all times manifested the lofty concepts of Islamic brotherhood. Outstanding for his high academic attainments and supreme professional skill Justice Akbar also made an extensive study of Islam and propagated the religion in every possible manner. Even before he passed a death sentence on a man who was found guilty in a murder case, he used to retire to his Chambers and pray to Allah to forgive him and say that he had no right to take anyone's life. This shows his compassion, human and humane qualities and his sympathetic feeling towards all human beings. That was the reason, he was held in high esteem by the people of all communities and they called him ‘A Judge who was a man of God'. Further, a salient characteristic in him was that throughout his life he shunned pompousness and frivolities. Justice Akbar served with Chief Justice Abrahams and Justice Koch in the contempt of court case where the then Editor of the Daily News was charged for an editorial he had written ‘Justice on Holiday'. The Editor was sentenced to a fine of Rs 1,000 and imprisonment till the rising of court. Furthermore, no case created so much interest in the public as the Duff House Case. It was a case in which one Stephen Seneviratne, a Barrister-at-law and an advocate was charged with having murdered his wife on October 15, 1933. After a trial of nearly one month before Justice Akbar and the Jury, the accused was convicted of murder on June 14, 1934, but this sentence was later commuted to imprisonment for life. In the latter part of his career as a Supreme Court Judge, he was called upon to sit in judgement in some of the biggest criminal cases of that time. He sat in judgement in this case where a well-known proctor from Gampola was involved and which resulted in the proctor's conviction. 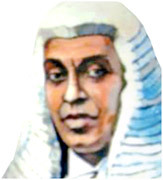 Justice Akbar (KC) retired serving as Supreme Court Judge, who in fact rose to become the Chief Justice of the Supreme of Ceylon. But, it was in the character of him to tender his resignation from the high office he held when a judgement of his was turned down in the Lord of Privy Council in England – then the highest appellate court of the Colonial Raj. He was appointed as a nominated member of the Colombo Municipal Council in May 1937. Besides, he served on many commissions and committees dealing with public projects of importance. He was a member of the Board of Education, Chairman of the Committee on the site for the proposed university and chairman of the committee on Muslim marriages. The Akbar Hall at the University of Peradeniya and a street in Colombo ‘Justice Akbar Mawatha’ are of course constant reminders of this great Sri Lankan Muslim. Indeed, Justice Akbar was a scholar, Educationalist, Lawyer, Jurist, Member of the Legislative Council, Lecturer in Law who produced generations of lawyers, Judges, workers in the course of social reforms and religions devotees and also made outstanding contributions towards the development of Muslim Law in this country.